So the pictures aren't as good as they could be...first day with a new digital camera and all...however, I wanted to post some progress photos. As I said in earlier posts, I finished the back and left front. I started the right front just after my last post. And this is as far as I have gotten. The second job...which is turning out to be super cool (I'm a Mac Specialist at the local Apple store. I love it!) and the *real* job, and Christmas shopping and...well, you get it. I am going to focus on this tonight and tomorrow night and should be zipping right along in no time. Looks great! I can't quite tell the color but it looks rich. 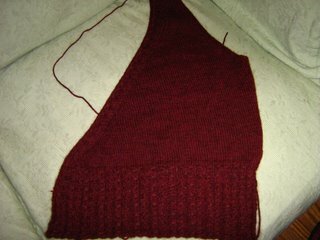 I finished the right front last night and am hoping to start the sleeves tonight. 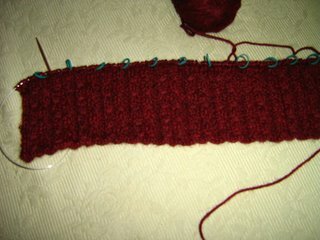 There's a slight color change between my two hanks, but I changed when the rib pattern ended so it's not too noticeable. It's a dark red and black heather almost. It's pretty and a good color for me. I still have some reading to do with this camera, it's turned out to be more complicated than I thought. Gorgeous! I just love that colour, and it's turning out so well. You can see the dark, deep red in the pictures but I wasn't sure if it was my monitor. 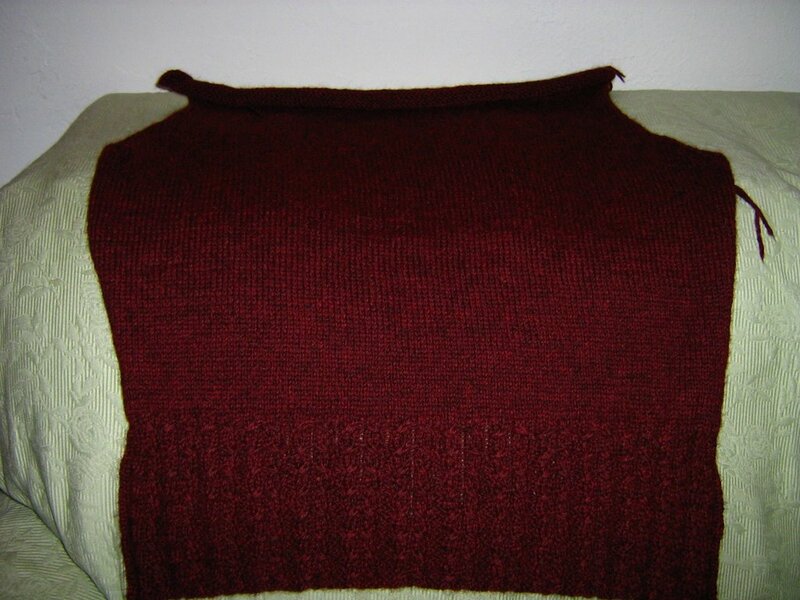 It looks like a a nice color match with the cozy but sophisticated pattern.